Buy full version with activation key for performing complete recovery mechanism and for saving the BKF file directly into the system. What is the Need for Recover Backup File? Backup Data is Essential when Original Data is Damaged: To take backup of most important data, is important and yet it is the most neglected arenas sometimes for some users. Backup of data should be at the top priority for maintenance of data. The devices suggested to store backup data are CD’s, tape drives, Zip Drives, floppy disks, etc. With NTBackup utility, in BKF files, your backup data is stored. On the one hand this backup data is secure but on the other hand, they are unsafe too. Backup data is unsafe because they can also lead to corruption because of virus attack, Trojan infection, missing catalog Files, human errors, software malfunctioning etc. The need for recover backup file is thus understandable so use MS Backup Recovery Software and meet your need for lost backup file. Support most Windows platforms like Windows 7, Vista, 200 etc. How to Retrieve Backup File? 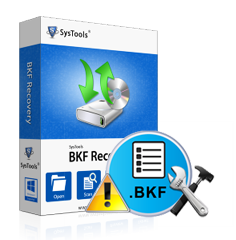 To repair corrupt backup file, in SysTools kitty, there is SysTools BKF Repair software for accomplishing need for recover backup file data. You can give a prior try to the software before you finalizing the software. To know more about the need for recover backup file, read the qualitative aspects of the software, go through the features. Copyright © 2012-2019 | All Rights Reserved.